Hunting down the murderer of their families in an anarchic Berlin of the near future, the outlaws Tan and Javid find themselves trapped in the wicked fairytale. From the opening scene of Arend Remmers Snowflake, or Schneeflockchen which is a much better word, you are aware you could be in for something really special. Our two protagonists, Tan, Erkan Acar (“The Key”, “A Time Of Vultures (Short)”), and Javid, Reza Brojerdi (“Homeland (TV)”, “Immigration Game”), are sat extolling the virtues of the humble kebab. I say they, Tan is the one who’s happy to be eating the kebab, right up until Javid says he hasn’t tasted anything worse and why does Tan keep bringing them to these dumps. As the camera pulls back from this Tarantino, Pulp Fiction-esq opening, we see even more influences from the man himself. These influences don’t stop with Tarantino either, there’s a surrealism and metaphysical feel to things that brings Charlie Kaufman to mind. Snowflake, still prefer Schneeflockchen, is one of the best films I’ve seen in sometime. Hilarious as it is dark, violent as it is thoughtful, a blood-soaked revenge comedy-thriller involving hit men, a man who believes he is god and a scriptwriting dentist. We’re in the not-so-distant future, Berlin, where the economy has collapsed and mob-rule, well, rules. The police ask you to call back later because the lines are busy and firemen don’t show up when there’s a fire. This latter point is important as it’s the whole reason Javid and Tan are out for revenge. As they hunt the man they hold responsible for killing their parents and siblings in a fire, Eliana, Xenia Assenza (“Goodbye Berlin”, “The Dark Valley”), with the help of her trusty friend Carson, David Masterson (“American Renegades”, “The Last Station”), hunt a bunch of hitmen to take out Javid and Tan, for reasons that will become clear when you watch the film. All of this is being predicted, for want of a better word, by dentist Arend, Alexander Schubert (“Heute Show (TV)”, “Forwards Ever!”), who writes screenplays as a hobby and, as he writes this particular one, the action begins to occur in real life to everyone involved. There is also David Gant (“Braveheart”, “Brazil”) as the man who believes he’s god (and Carson’s father) and Mathis Landwehr (“V For Vendetta”, “Speed Racer”) as Hyper Electro Man, a renegade man dressed like Daredevil who is on a crusade to save Berlin from the bad-guys. Oh and last, but not least, there’s Schneeflockchen herself, Judith Hoersch (“A Cure For Wellness”, “Train Station”), a singer dressed as an angel. If that all sounds mad, great, that’s precisely what it is, but mad in the most wonderful way. Written by Arend Remmers (“A Time Of Vultures (Short)”, “Unsere Zeit ist Jetzt”) and directed by Adolfo J. Kolmerer (“A Time Of Vultures (Short)”, “Unplugged”) and William James, Snowflake is full of snappy dialogue, sick and twisted characters and wonderful, wonderful performances. There are so many characters in Snowflake, yet each of them gets just the right amount of screen time (though Gant is so good you wish you could see more) and just the right amount of story. You know all you need to know about them, that in itself is great writing by Remmers. I'm gonna make you squeal! Gant, as the man who thinks he’s god, is stunning, it’s a shame we don’t see more of him, but what we do see of him he steals every scene he is in. Brojerdi and Acar are like onscreen brothers, the two have looks and movements between them that you would expect to see from people who’ve spent a long time with each other. Schubert, as the manic screenwriting dentist, reminds me of a slightly tamer Sacha Baron Cohen though Schubert is a much better actor. The way he infuriates Javid and Tan, as he’s predicting everything they say, is wonderful. All of these characters are superb, and we haven’t even got to the hitmen Eliana wants to hire to bring down Javid and Tan. From cannibal Polish brothers, one of whom only squeals like a pig, to hitmen who have contracts and paperwork to a mad, maniacal man who is building an army of faceless soldiers for who knows what. 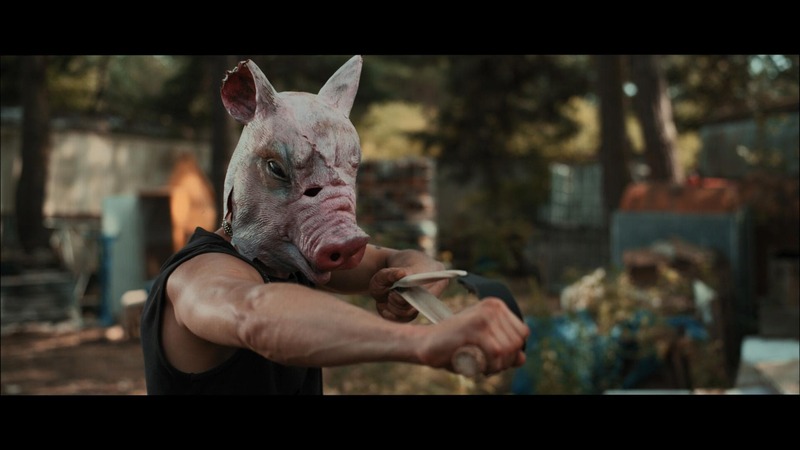 Snowflake is a wickedly humoured, violent, batsh*t crazy film that you should seek out and watch.